It has been so cold and wet this weekend I’m back making winter soups. There was even some snow the other day when I was on the way to work. I’m convinced every time I have a plaster cast on my arm the weather is horrible as I struggle to get a jacket to fit over my giant arm. I’m really looking forward to the spring and summer months and focusing on different styles of recipes like salads, ice creams and beautiful smoothie bowls. As I’m writing this post I’m enjoying a big bowl of this butternut squash, spinach and bacon soup. 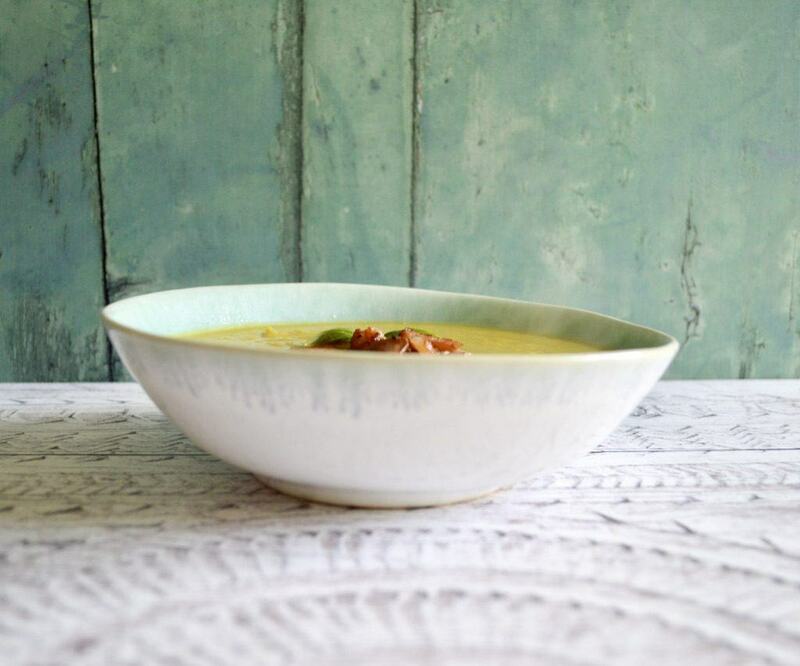 I know I always say this but it is up there as one of my favourite soups – the smokiness of the bacon just makes it extra special. I also have a new recipe in the oven for strawberry and coconut slices. Fingers crossed they work out well and I’ll share the recipe soon. Coming up this week …. "Gluten and Dairy Free Cajun Prawns"
"Gluten & Dairy Free Choc PB Banana Frozen Shells"